A cholescintigraphy scan, also known as: hepatobiliary iminodiacetic acid (HIDA), paraisopropyl iminodiacetic acid (PIPIDA), or diisopropyl iminodiacetic acid (DISIDA) scan is a nuclear imaging procedure to evaluate the health and function of the gallbladder. A radioactive tracer is injected through any accessible vein, then allowed to circulate to the liver, where it is excreted into the biliary system and stored by the gallbladder and biliary system. In the absence of disease, the gallbladder is visualized within 1 hour of the injection of the radioactive tracer. If the gallbladder is not visualized within 4 hours after the injection, this indicates either cholecystitis or cystic duct obstruction. This investigation is usually conducted after an ultrasound examination of the abdominal right upper quadrant for an individual presenting with pain. If the non-invasive ultrasound examination fails to demonstrate gall stones (or other obstruction to the gall bladder or biliary tree) in an attempt to establish a cause of right upper quadrant pain, this cholescintigraphy scan can be performed as a more sensitive and specific test. 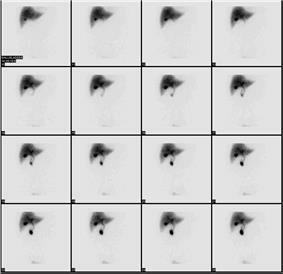 Cholescintigraphy scans are not generally done first line due to their increased cost and invasiveness. Cholescintigraphy for acute cholecystitis has sensitivity of 97%, specificity of 94%. Several investigators have found the sensitivity being consistently higher than 90% though specificity has varied from 73%- 99%, yet compared to ultrasonography, cholescintigraphy has proven to be superior. The scan is also important to differentiate between neonatal hepatitis and biliary atresia, because an early surgical intervention in form of Kasai portoenterostomy or hepatoportoenterostomy can save the life of the baby as the chance of a successful operation after 3 months seriously decreases. Tc bromo-2,4,6-trimethylacetanilido iminodiaceticacid (BrIDA/Mebrofenin) have replaced it, but the term HIDA remains. ^ Michael, Picco, M.D. "HIDA scan (cholescintigraphy): Why is it performed?". Mayo Clinic. Retrieved 2007-12-11. ^ Shea JA, Berlin JA, Escarce JJ, Clarke JR, Kinosian BP, Cabana MD et al. (1994). "Revised estimates of diagnostic test sensitivity and specificity in suspected biliary tract disease.". Arch Intern Med 154 (22): 2573–81. ^ L. Santiago Medina; C. Craig Blackmore; Kimberly Applegate (29 April 2011). Evidence-Based Imaging: Improving the Quality of Imaging in Patient Care. Springer. p. 530. ^ Jorge A. Soto; Brian C. Lucey (27 April 2009). Emergency Radiology: The Requisites. Elsevier Health Sciences. p. 380. ^ Krishnamurthy, Gerbail T.; Krishnamurthy, Shakuntala (31 July 2009). Nuclear Hepatology: A Textbook of Hepatobiliary Diseases. Springer. ^ Puthenedam, Manjula. "SNM issues guidelines for hepatobiliary scintigraphy". Retrieved 2012-12-02.